Christmas is just around the corner, and I think it's time to have some Christmas games for fun now. 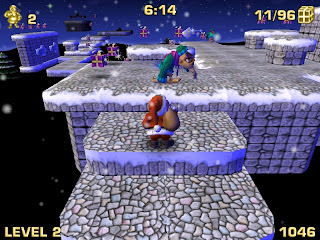 Almost instantly, Santa Claus In Trouble comes to my mind, and it is indeed a very suitable game for the holiday season. Besides nice graphics, the Christmas songs are pleasantly played during the game too. 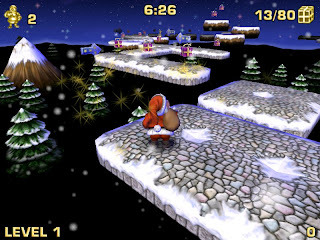 In Santa Claus In Trouble, we play Santa Claus, who must gather the lost presents scattered around in 10 levels. 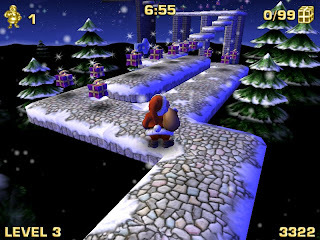 The level design of Santa Claus In Trouble is some how like Prehistorik, where we need to jump from one platform to another platform and collect the presents. The difference between them is, Santa Claus in Troublr is in full 3D. There are some monsters that will block the our way. We cannot kill them, and the only thing we can do is to avoid them. 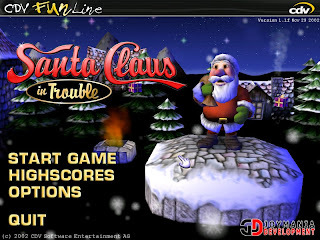 Santa Claus in Trouble is a light and enjoyable game which is suitable to gamers of all ages. It is fun enough to keep you going way past the holiday season. This is a Windows game, so you don't need to use DosBox for this one. You can download Santa Claus In Trouble here.